The MSI R7950 Twin Frozr 3GD5/OC graphics card ships with one of the world’s most advanced and versatile GPUs - AMD Radeon HD 7950. The revolutionary 28nm GCN architecture as well as bunch of advanced technologies enables astonishing performance and breathtaking image quality. When used with MSI’s Afterburner overclocking software, the MSI Twin Frozr 3GD5/OC supports GPU overvoltage function to fully unleash the overclocking potential. The unique propeller blade on Twin Frozr III and military class III components ensure stable and reliable performance. MSI-exclusive Propeller Blade Technology & Twin Frozr III The MSI R7950 Twin Frozr 3GD5/OC features the Twin Frozr III cooling design with the MSI-exclusive propeller blade technology. When compared with traditional fan blade design, it increases the air flow by 20%. And MSI advanced Twin Frozr III thermal design brings you an up to -10°C cooler and 13.7 dB quieter gaming experience than reference design. Afterburner With Afterburner overclocking utility, the MSI R7950 Twin Frozr 3GD5/OC enables all MSI graphics cards users to boost performance and to monitor all kinds of critical information in real-time. Afterburner is a completely free utility which is compatible with almost all MSI graphics cards. Military Class III Components The MSI R7950 Twin Frozr 3GD5/OC graphics card uses the Military Class III Components such as Hi-C CAP, Solid State Choke (SSC), and all-solid capacitors to enhance the overclocking headroom under high-load conditions. Hi-C CAPs increases GPU stability and lifespan of the graphics card, while SCC has higher current for better overclocking ability. New GCN Architecture for DirectX 11.1 Performance AMD Radeon HD 7900 Series (codename Tahiti) boasts the world's first 28nm GPU architecture which is optimized for gaming and compute. The AMD Radeon HD 7950 features 28 Compute Units, each with 64 Vector Units for 1792 Stream Processors, along with dual geometry units, dual Asynchronous Compute Engines (ACE).With the 28nm GCN Architecture, the AMD Radeon HD 7850 GPU offers full support for DirectX 11.1 for fantastic gaming effect. Next Generation AMD Eyefinity Technology & AMD HD3D AMD Eyefinity 2.0 features all-new support for stereo 3D, universal bezel compensation, brand new display configurations and an expanded and more immersive field of view. With full support for HDMI (with 4K) and DisplayPort 1.2 HBR2, the AMD Radeon HD 7950 is set to drive next generation displays at up to 4K resolution. The AMD Radeon HD 7950 is also backed by AMD’s open 3D initiative for stereo 3D gaming and Blu-ray 3D movies. Refined AMD PowerTune Technology & AMD ZeroCore Power Technology Designed with the most advanced power management features, the AMD Radeon HD 7950 is equipped with the intelligence to convert unused power headroom into extra performance by dynamically controlling clock speeds, allowing gamers advanced performance inside of the power envelope they specify. AMD ZeroCore Power technology found in the AMD Radeon HD 7950 enables lower idle power than any other currently available graphics card. With support for AMD CrossFire technology, AMD ZeroCore Power eliminates wasted power, as well as additional heat and noise from extra cards when you are not using them. - 10 degree cooler & 13.7dB quieter than reference design!!! - SSC (Solid State Choke) has higher current for better overclocking ability. 10.28" x 4.37" x 1.5"
Other Thoughts: New card is going to be cheaper and much better at this point. Hopefully it lasts 5 years too. Thank you for your feedback, sorry to hear about the issue. Please do not hesitate to contact us directly at usreview@msi.com or at our support number 626-271-1004 M-F 6am to 6pm PST. provide us with your product serial number and we will be more than happy to assist you, thank you. Other Thoughts: I'm usually very generious with my review, but to be as impartial as possible, I believe I have fairly rated this product 1 star out of 5 stars. I believe any broken product cannot receive anything higher than 1 star. This is only my experience, some other customers have found success, so please take this review with a grain of salt. 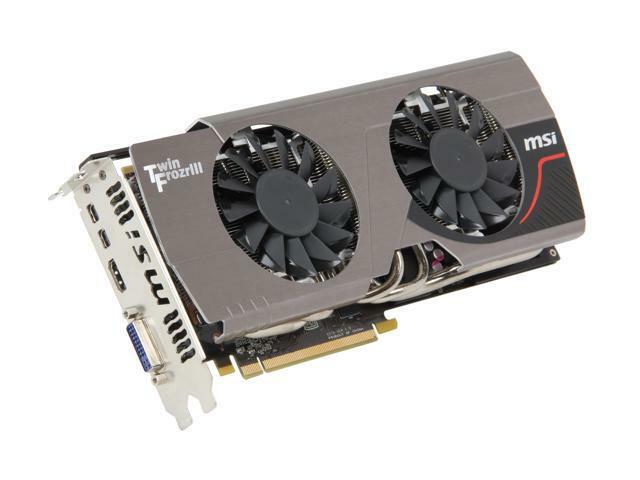 I initally purchased the, MSI R7950-3GD5/OC BE Radeon HD 7950 3GB 384-Bit GDDR5 PCI Express 3.0 x16 HDCP Ready CrossFireX Support Video Card, and the card was defected. MSI took about 2 months to send this card as a replacement and the card worked. However, for the past 2 months (about 9 months after), my monitors would would glitch and my computer would freeze and I would have to force a shut down on my computer. I thought it was my monitors, but after testing different monitors, the same thing would occur as well. Also, my monitors have low brightness to perserve my monitor health as well. With this evidence, I doubt my monitors nor the other monitors I've tested is causing the error, it must be the VGA. I don't know if MSI will give me a replacement, but hopefully they may be able to send me another card (maybe third time is a charm?). Many people have said this is was a quiet fan, but boy is it loud. Anytime I open any gaming applicaiton, my very quiet computer becomes super loud. My room is near the end of the house and you can hear the fan from the entrance of the room (I am not exagerating). I've cleaned my computer, no dust is on the product or in my computer tower, yet the noise still exists. I then put all my graphics on the lowest setting (not sure why anyone would shell pay a premium price for a VGA to play games or watch movies on the lowest settings), and the fan noise is still very loud. I will be more than happy to change my review if I receive a working product. I hope my review show my poor experience with 2 VGA products from MSI. To help the PC community, I hope this review serves future customers from any frustration they may experience. 1. Check and make sure that power are connected correctly and firmly. Have had since Feb.2013 and have had not one bit of trouble. It is a solid build. Other Thoughts: Although I am upgrading in a few days I am putting this beast in my son's build. It will give him a few more years I reckon. Pros: Great cooler. Much more quiet than reference or even other upgraded coolers. Factory overclock provides great framerates even @ 1440p. Cons: Broke twice in 2 years. Even though the item is still under warranty, MSI has told me they cannot replace it because they are out of stock. They offered me a 50% refund from my purchase price(Not acceptable) OR a reference design 7950(not acceptable). At first the e-mail responses were slow(2 business days) but they turned even worse once I questioned why I cannot be given a newer card of similar performance. I have not had a reply in 5 business days + 2 weekend days. If you have any questions or concerns regarding the product, please do not hesitate to contact us directly at usreview@msi.com and we will be more than happy to assist you, thank you. Other Thoughts: no regrets with this card. stays under 70c with my setup OC'd. Pros: I managed to snag two of these cards and got lucky with both being 8+6 pin 7970 PCBs. They are stock boost clocked to 960 core and 1250 memory, so I don't know where the MSI support tech responding to reviews is getting that none exist. I asked MSI for a UEFI GOP bios and permission to redo the thermal paste after seeing high temps, and got both. Secure/Fast boot is great and crossfire is very smooth on the latest catalyst beta. Cons: The price goes up and down quite a bit, as do the included items. Having to redo the thermal paste is not something I expected. Other Thoughts: If you can get them at the price you want, you'll outperform a titan at a very small fraction of the price. Cons: The specifications shows this comes clocked at 880mhz and 1250 memory. Imagine my hopeful surprise when I saw the stock core (not boost) clocked at 960Mhz and 1250 memory. I was surprised alright....... Surprised that my Asus 1gb 6870 out performs this!!!!!. I did the catalyst updating, MB Bios,checked power outputs etc looking for problems. Well it looks like I got a bad card with NONE of the atypical or usual indications. I just assume it was burned in (overclocked) to try and squeak by and pass a Q.C. test at the factory ... then out the door! Defective core power states, just conjecture in my opinion. I mean really?........ a 1gb 6870 out preforming this card?? MSI doesn't have any R7950 with 960MHz core and 1250MHz VRAM.